I was thinking about building a delay circuit quickly and effectively and with small footprint. The idea is to delay a signal either from a camera or from other camera triggering devices and then trigger a flash after the delay. Beside my need to build such a circuit, it is also my goal to share it and make it DIYable. Therefore, using a small microchip came up to my mind. One such MCU is Attiny45 series by Atmel (now Microchip) as it is so popular and you can use an Arduino to program it. While searching for Attiny45, I came across something that I have forgotten — DigiSpark boards! DigiSpark board was made possible by DigiStump LLC, these folks are geniuses who crammed a USB bootloader into tiny Attiny85 chip and still have about 6K flash left for programmers, which for most applications, 6K is enough. It is also compatible with Arduino development environment which is a huge plus and it can be programmed via USB connection. It is an amazing little board. into Arduino environment under File->Preference like below. The rest of installation is as easy as following instruction on the page. 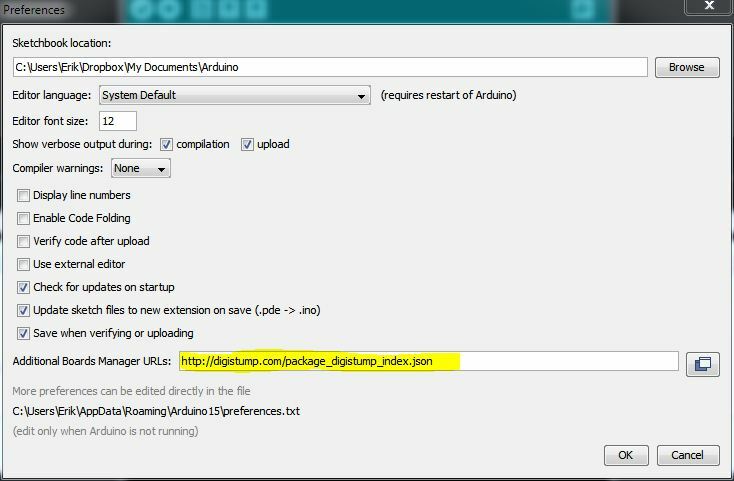 After installing DigiStump on Arduino IDE, it is time to develop and deploy but make sure you set the right Programmer and select the right board per installation instruction above. So, leave your DigiSpark board unplugged, click Upload on Arduino IDE and wait for prompt to plug in the board. This is the part I had trouble with, so it is worth mentioning it here. Beside above warning or tip, because DigiSpark is such small MCU, its pins are purposed to many other tasks, such ADC, digital, I2C pins, etc. If you encounter some weird upload error, unplug your DigiSpark board from your circuit and program it that way. Here, the 5V and GND are inserted into power rail on the bread board while all other pins are inserted, too. This allows the circuit to be powered by a USB power bank for phones. This is my favorite configuration with one important warning: the 5V is now inserted into the blue line where normally it is marked as – sign and the GND is inserted into the red line where it is usually marked as + sign, so keep this in mind when wiring. The second thing is plethora libraries for this tiny board. One such library is the OLED screen driver. On the same day I received my DigiSpark boards (probably a “bad” clone), my order of an 0.96″ OLED screen intended for other projects also arrived. Learning how to program the DigiSpark, I saw that there is this OLED library with sample, so I quickly wired it up (only four wires, 5V, GND, SDA, and SCK), initially, it did not work as my OLED has an I2C address of 0x78, I guess the default library is something else, so I defined address to be 0x78 (see attached code) and it worked right away. I was totally amazed by it. One bad impression I got is that the pin 5 still has RESET enabled. This is probably due to the cheap clone I got (DigiStump has temporarily stopped shipping). This essentially renders the board to have one less (or half less, see more) pin and it is dangerous if this pin is left floating which will cause the board to reset randomly. The reason I say it is probably half pin is that it seems I can still use it as an analog pin, only when voltage drops below 2.5V (on 5V power), it resets. Above 2.5V, I still can read good reading from this pin. Another thing that is different from Arduino is that when powering up, it takes about 5 seconds to get to your code. This is because the boot loader needs to determine if any new code are being loaded upon powering up. Overall experience is excellent, it is small and its compatibility with Arduino IDE makes it much easier to code and deploy (though not as easy as real Arduino). It is perfect for small projects like temperature reading, monitoring, with displays. Here is one example code that I wrote, just to play with this amazing board. Basically, it takes a signal from pin 1, delay it for some time determined by a POT on an ADC pin, then output the signal to the real target. This is inspired by the need for focus stacking where it is highly desirable to fire a flash in the middle of a (long) exposure to reduce vibrations caused by shutter moment. // this is used to increase range. // as ADC is very, very noisy. // for analog read, no need to configure it. digitalWrite(PIN_INPUT, HIGH);      // set pullup resistor on INPUT by writing HIGH to it.